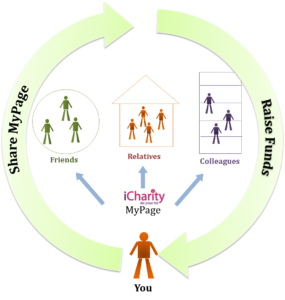 MyPage is a fundraising tool using which you can raise funds by requesting contributions from friends, family and colleagues for a cause which you strongly believe in. You can use special occasions in your life such as birthdays, anniversaries etc. to ask your friends and near ones to donate instead of giving you a gift. What is myPage all about? It’s an alternative way of fundraising from a large group of people for specific project or a series of causes. All you need to do is create mypage and send it your near-dear ones by emails or share via social media etc. You don’t have to chase anyone to collect cash/cheque. It’s all online. iCharity will ensure that your collections reach your cause and are utilized effectively. Step 3 : Fill up the required information and click submit. Step 4 : Search causes and add it to myPage. Step 5 : Share with friends. Step 6 : Receive donations and track results. Why use the myPage feature of iCharity? Get iCharity Times on mail for updates.